The helicopter company Héli-Boréal inc. offers a wide range of helicopter transport and charter services based in Sept-Îles and throughout Québec, Labrador and northern Canada. With many years of experience as an air carrier, Heli-boreal excels in safety, customer service and with a sustainable view towards our environment. The president of the company, Martin Noël, has put forth a mission for his team to provide the best helicopter location services within Québec in order to meet the demanding needs of our clientele. Our team of pilots has gained much experience with our fleet of Eurocopter Astar 350 and Colibri helicopters, allowing them to remain current and provide the best helicopter services in the region. Heli-Boreal is a company whose reputation for providing safe and reliable services is well recognized. Specializing in many sectors, Heli-Boreal operates across the nation. Our various transportation services and specialized aerial work that are offered to our customers are of high quality and meet their expectations. 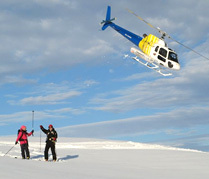 At Heli-Boreal, the safety of our passengers and employees is paramount. Our helicopters are subject to a rigorous and innovative maintenance. Safety is our number one priority. This commitment is also reflected in the importance we attached to training and maintenance of our aircraft and equipment on a regular basis. For an expedition by helicopter in northern Quebec, we must rely on a safe, reliable and efficient helicopter fleet. Heli-Boreal explores Northern Quebec and Labrador coast in confidence with his Eurocopter helicopters’ models AS350 BA, BA +, B2, and B3, recognized worldwide.